The scene of incident site at Luka Airport. Picture is taken from nepalkhabar.com. 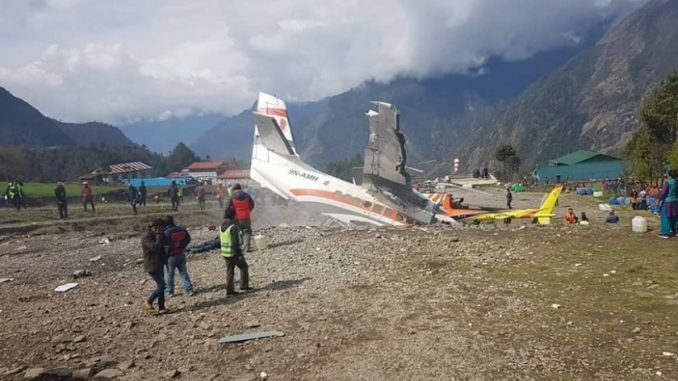 Pokhara—At least three persons have died and three other injured when an aircraft and chopper collided at Lukla Airport in Solukhumbu district at 9.6 am this morning. Summit Air’s co-pilot Sudip Dhungana and tourist police’s assistant sub inspector Ram Bahadur Khadka who was in duty at airport were killed on the spot when another ASI Rudra Bahadur Shrestha succumbed to injury. Summit Air’s captain Rabindra Rokaya and Manang Air captain Chet Gurung have been injured during the incident and they have been taken to Kathmandu for treatment. The condition of Rokaya is said to be serious. According to Solukhumbu Chief District Officer Narendra Kumar Rana, Summit Air’s hostess Rashmi Lama’s condition is normal. Summit Air’s Pilot, co-pilot and an air hostess were on board during the incident. CDO Rana further informed that the Summit Air’s aircraft hit a parked Manang Air’s chopper while former was trying to take off. Preliminary report claims that the aircraft skid off the runway and reached to hit the parked chopper. The aircraft was going to take off for Ramechhap but it hit a Manang Air’s chopper then Shree Air’s chopper. Both aircraft and Manang Air’s chopper overturned during the incident that created fire in the incident site.